Bread Pizza Pakoda | Bread Pakoda Recipe with step wise pictures is a little innovation towards Bread Pakora Recipe. You must have prepared Bread Pakora sometime or atleast have cherished the same. Here in this recipe, we are just taking the Bread Pakora Recipe little ahead with few changes and making Bread Pizza Pakoda. The changes we are taking about are with respect to the stuffing of the Bread Pakora only and the process of making Bread Pakora and Bread Pizza Pakoda is the same. 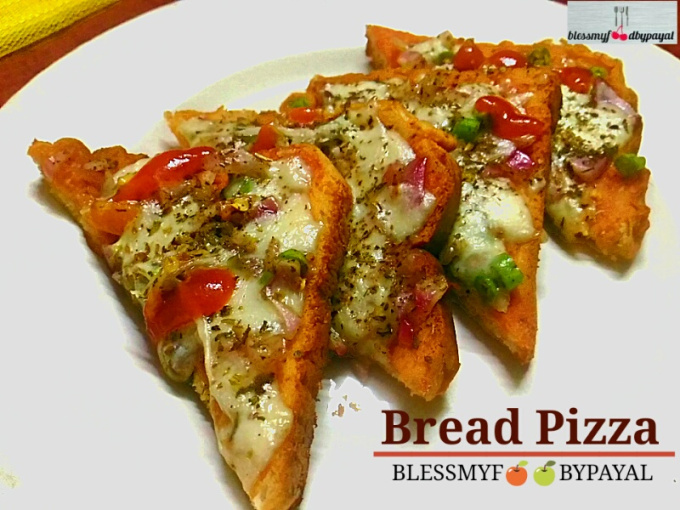 Bread Pizza Pakoda is something which will be more inviting to the kids and they will love it for sure due to the presence of gooey mozzarella cheese inside. The process of making Bread Pizza Pakoda is so easy and you don’t require any unusual and expensive ingredients. The best part of the recipe is that it gives free hand to use most of the ingredients by choice. Have a look at the recipe and prepare this amazing snack for your kids or guests and seek all praises. Bread pizza pakoda is a unique combination having taste of both pizza as well as pakoda. Roughly chop carrot, green beans & onion. Keep aside. Take 1 tbsp of oil in a pan and place it on the gas stove. Add chopped carrot, green beans, onion and salt. Saute just for a minute and switch off the flame. Keep aside. Take 4 Slices of bread and apply tomato ketchup on them. Now spread half of the grated mozzarella cheese on 2 of the bread slices. Over the grated cheese, now spread the sauted mixture of vegetables already made. And over that, now spread a layer of rest of the mozzarella. Now cover the face of the stuffed side of the bread slices with other 2 bread slices on which tomato ketchup has already been applied. Bread slices are to be joined in a way that the stuffing on one bread and ketchup applied side of other slices should come together in between making them a sandwich. Take a bowl and add all the ingredients as shown under the head "Batter"in the Ingredients list, except water. Finally add water very slowly and carefully and make a thick batter out of it. Take one sandwich, dip it in the gram flour batter, coat it properly and drop it in a hot oil. Fry them until turn golden brown and remove on a paper napkin to release excess oil. Bread Pizza Pakora is ready. Serve hot with tomato ketchup or any dip of your choice. 1. Roughly chop carrot, green beans & onion. Keep aside. 2. 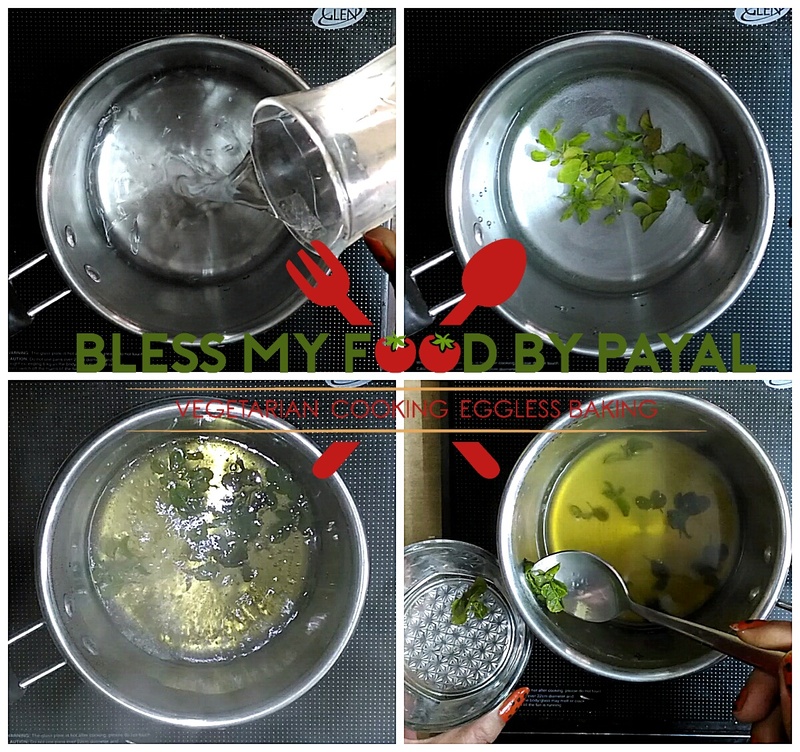 Take 1 tbsp of oil in a pan and place it on the gas stove. 3. Add chopped carrot, green beans, onion and salt. 4. Saute just for a minute and switch off the flame. Keep aside. 5. Take 4 Slices of bread and apply tomato ketchup on them. 6. Now spread half of the grated mozzarella cheese on 2 of the bread slices. 7. Over the grated cheese, now spread the sauted mixture of vegetables already made. 8. And over that, now spread a layer of rest of the mozzarella. 9. Finally sprinkle mix herbs. 10. Now cover the face of the stuffed side of the bread slices with other 2 bread slices on which tomato ketchup has already been applied. 11. Bread slices are to be joined in a way that the stuffing on one bread and ketchup applied side of other slices should come together in between making them a sandwich. 12. Keep the sandwiches aside and now prepare the batter. 13. Take a bowl and add all the ingredients as shown under the head “Batter”in the Ingredients list, except water. 14. Finally add water very slowly and carefully and make a thick batter out of it. 15. Take one sandwich, dip it in the gram flour batter, coat it properly and drop it in a hot oil. 16. Fry them until turn golden brown and remove on a paper napkin to release excess oil. * You can use any vegetable as a stuffing depending upon your choice and liking. * We have sauted the vegetables for a minute only to maintain their crunch. However you can totally skip the sauting part and directly mix vegetables and start stuffing. * Adding rice Flour in the batter mixture gives a crunchy texture to your bread pizza pakoras. If Rice Flour is out of stock, you can simply skip it out rightly or replace it with 1/2 tsp of Baking soda. * While coating the sandwich in batter, you have be little quick. Putting sandwich in batter for a long time may break your sandwich and you will not be able to fry it. * Size of your bread pizza Pakoda will depend upon the size of the bread you use. We had small sized bread slices so we didn’t cut and divide the slices. But if you are using big sized slices, then better cut them into 2 to 4 pieces depending upon your suitability. * If you are short of mozzarella cheese or you intend to make Bread Pakora only instead of Bread Pizza Pakoda, then you need not to make any major changes. * You can simply stuff mashed potatoes and boiled green peas mixed with other species in between the Bread slices and fry them after coating in gram flour batter made with the same ingredients and method shown for preparing Bread Pizza Pakoda. As simple as that. Also have a look at the recipe of Bread Pizza in this blog. Thanks a bunch Nisha for the sweet gesture. Truly honoured. Such a droolicious recipe…double yumminess….perfect for this chilling weather !! You never leave any opportunity to visit and comment any post. Glad to see your concern. Thanks a million for everything you do.